The term "Family Reunion" is one that is typically followed by the onset of mother-in-law hatred and the frustration seeing people you'd rather not. People you object to being related to, but you put up with it for loved ones and those you care about. Perhaps it is a positive term, and you enjoy it when it happens... For us though, it's a bit different. Our family is spread out, with thousands of miles separating us all, but when we come together, I remember why I wouldn't trade my friends for anyone or anything under the sun. This is why we're here, this is why we do what we do, and this is what drives our passion as car enthusiasts. The day I moved away from Tennessee and the "House of Stance" was no more, I knew that we wouldn't be seeing each other as often. As it was, for us Tennesseans and Georgians to meet up, it was 250 miles at minimum, and that still left out everyone else. When we found reasons big enough for all of us to come together, it always concluded with the sentence "that was the best weekend ever." That's part of the trouble with the friendships we've all found ourselves with today. We can thank this community for the greatest people in our lives, but we also owe it the frustation of putting distance between us. That's why I'm confident none of us had any idea what was in store for the third weekend of December. The initial plan was simple. 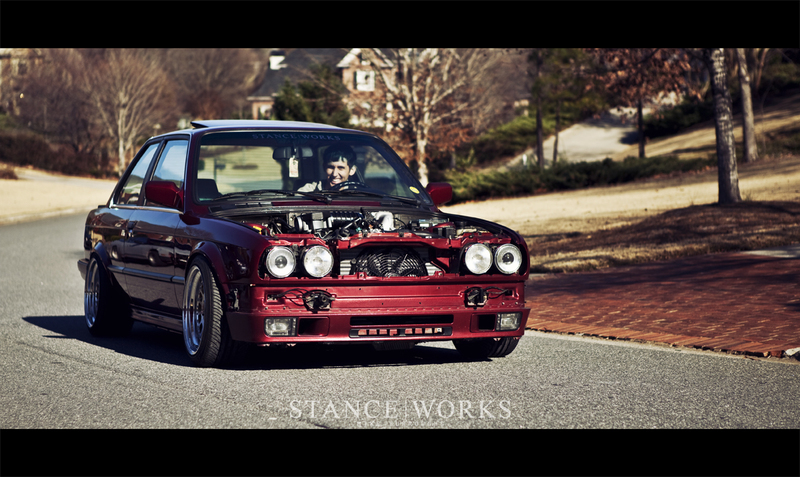 Ryan Sermonet's showroom-clean E30 was due for an engine swap. From baby six to the big six, an M30. Ryan and the rest of the Georgia crew, Kasey, Jeremy, Alie, Josh, CJ, and Erin would put in work to get the swap wrapped up. By complete chance, Nick Nikolov was in town from Connecticut on this very weekend, meaning the presence of a familiar and missed face. Rachel and Rodney figured they'd head down from Tennessee to join in on the fun and get a bit of a family renunion going. The humorous part is that we have a bit of a habit of trying to surprise each other. At H2Oi, Ryan decided to fool us all and tell us he couldn't make it, and since then, it's been a constant battle of one-upmanship. I had the unique plan of purchasing a plane ticket to fly in and not tell anyone I was going to show up. As did Charlie. And Kielan. And Cory too. You can imagine everyone's surprise as we each showed up one by one unannounced. The weekend was only getting better and better as everyone I considered a close friend just happened to have the same idea I did. To ice the cake, after hearing of everyone's arrival, Brennan and Hunter made the 4-hour trip down to join in. There's no question that none of these names mean a thing to you, but that is rather inconsequential. What I know most of you can relate to is the time spent smearing grease and grime all over ratty clothes as you work on projects with friends; the time spent laying under cars busting knuckles as you attempt to make things line up. It's times like these I would't trade for the world. 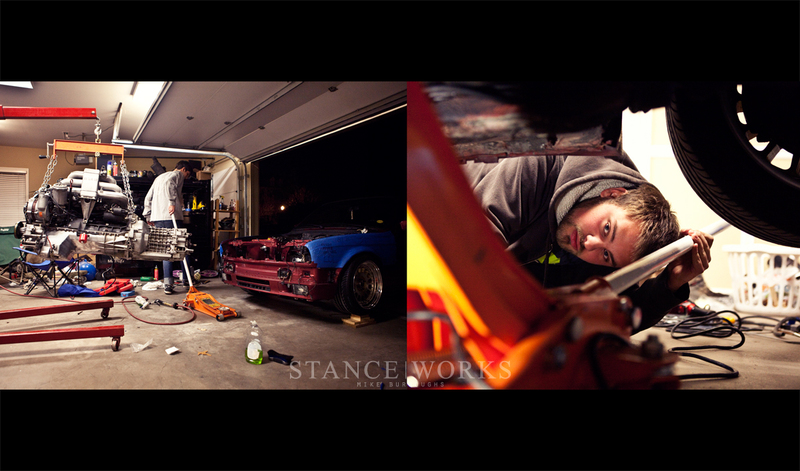 To know the people I care about put in just as much effort to be a part of Ryan's weekend reassures why we made StanceWorks to begin with. There's really no hope in explaining the passion behind it all to people outside of the world we've created. From a desire to hang out with people "from the internet" instead of friends from "real life", to taking vacation days to replace an engine in a car. It may not make sense but perhaps it's better that way. I'll take it nonetheless. We spent Saturday night working quickly and diligently to get Ryan's car running, and after just 6 hours, we had the engine and the swap completed. After firing it up and running it down the street and back, even the neighborhood security showed up to celebrate. They were kind enough to tell us how wonderfully loud the car was and that it was even loud enough to wake up everyone on the street. It went off without a hitch, and was without question the smoothest engine install I've been a part of. His car as a whole is one of the nicest out there now, and drives better than anything else I've been in. The M30's torque and child-eating qualities prove a perfect match for Ryan's car. For Ryan, on a personal level, the weekend was a success. His car swap was completed without the least of hiccups. But for all of us, success is hardly fitting. Just when you assume you can't grow closer to your best friends, you manage to squeeze out just a little bit more. When we'll all be back under the same car, I don't know, but I'll have to be patient until then. In the mean time, Ryan will have to keep us up to date on his build. Do yourself a favor and bring your family together as soon as you get the chance. Remind yourself why we're all in this to begin with. 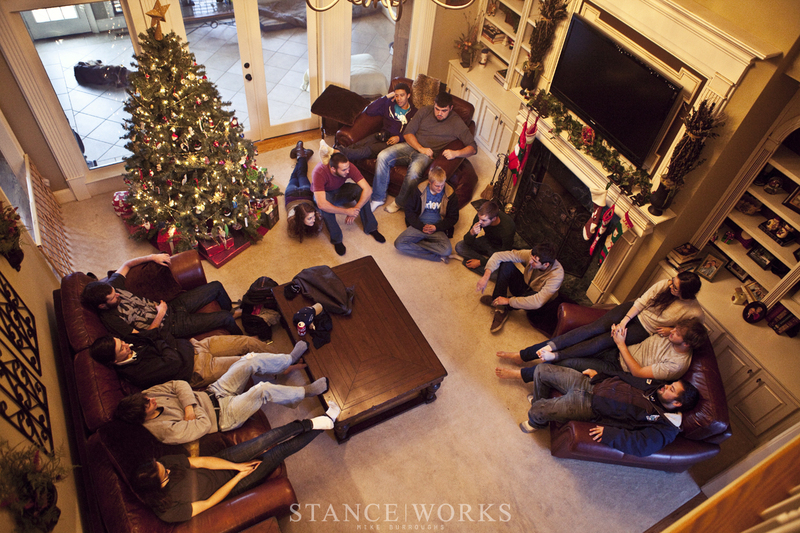 And of course, Merry Christmas from the StanceWorks Family. Wish i was there too, but im on te other side of the world, in Romania, but still a bmw sick, i feel you as my familly too…..